The other day while I was writing my Morning Pages, I found myself imagining my life if I were a hermit in the woods. I described the tiny cabin I lived in with its little wood burning stove. I imagined the forest around me, dense and rich with moss and ferns. On and on I wrote, detailing the plants in my cottage garden, the cats that would live with me, and the many old timey hobbies that would occupy my time. I thought of myself as a Henry David Thoreau, living by my own imaginary Walden Pond. Then my Morning Pages ended and I had to crash back to reality. Student loans, career paths, bills, and other practicalities came back to rest on my shoulders. It was a little depressing thinking that I will likely never get to play out that fantasy. And then, being the obsessive list maker that I am, I thought about how I could turn this into a list. So I cracked open my Leuchtturm, lettered a lovely header with my Tombows, and began to write. What I came up with is the “If I Didn’t Need Money” list. Basically, the whole point is to think of all the crazy things I’ve wanted to do – impractical hobbies, wacky careers, or bohemian lifestyles that are ridiculous, but fun to think about. Then I just listed them out, plain as can be. The trick to this exercise is to let go of reality. Let your imagination run wild. What would you do? Which career path would you switch to right now if it wasn’t such a crazy idea? What hobby have you always wanted to take up? If an idea flutters into your head that is absurd on its face, it can be hard to convince your hand to write it down. But capture that thought! These fantasies need to be given a little bit of air time. Be willing to play with the idea of quitting your job and running away to the Bahamas to live on the beach and perfect your basket weave. Why not? 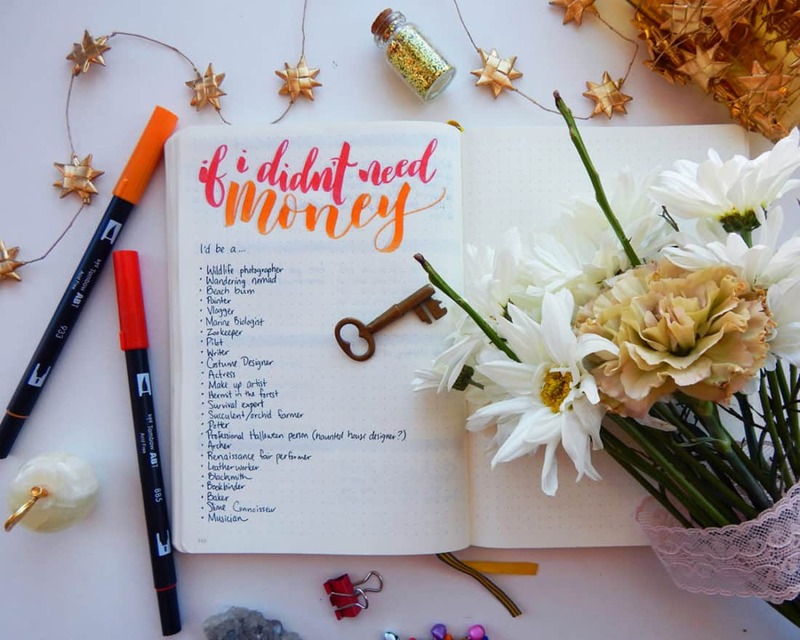 Write at least 20 things that you would do if you didn’t have to worry about money. If you wanted to, you could push it further and create a full List of 100! It is helpful to think back to when you were a kid. What did you want to be when you grew up? Did you abandon that childhood dream of becoming an astronaut because you lost interest, or because people told you that you couldn’t? Bringing yourself back into the mindset of a child with no inhibitions and no responsibilities is a great way to get into the spirit of this exercise. You might be thinking that this is a silly exercise. Well, yes, you’re not wrong. It is silly! That’s sorta the point. We spend so much of our time as slaves to our responsibilities that we grow tired, dull, and lackluster. This list is an excuse for you to get a little silly, think outside the box, and lighten up a bit. Besides, if you are looking for how to find your passion, then this is an excellent starting point. 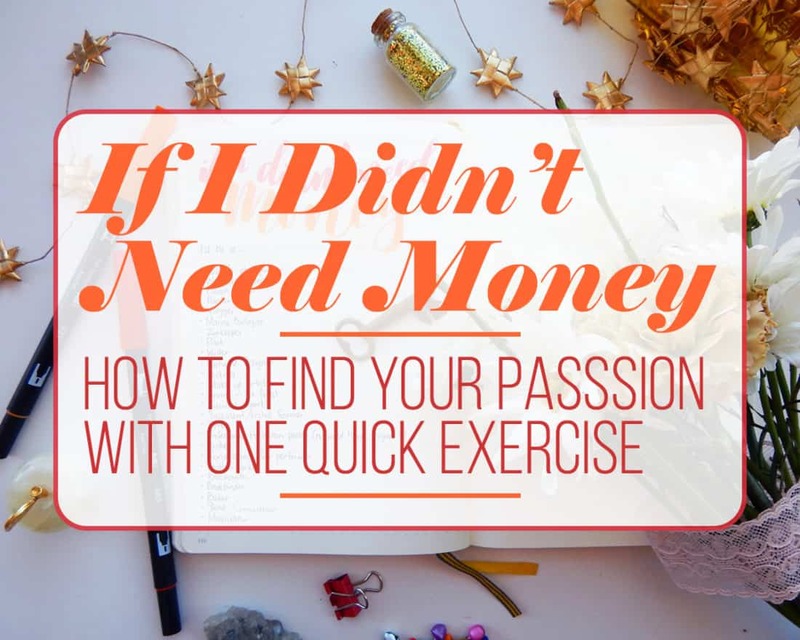 If you are a young adult with no idea what to focus on, a recent retiree with lots of time on your hands, or someone who has never really fallen into a hobby or career that captures the heart, then this list will help you tremendously. Are any of these realistic scenarios for me? No, not really. But taking a moment to imagine myself as a professional Halloween person, whatever that might be, is such a delight. Besides bringing you a moment of giggles, this list can help you in a deeper way. Writing things out in a list like this, especially if you write at least 30 entries or more, can help unlock subconscious desires. If your life has been feeling stagnant or unfulfilling lately, perhaps the answer to your discontent is hidden in this list. Maybe all that’s holding you back from your dream is your fear that it is too absurd to possibly consider. Or perhaps this list is simply the springboard into a new chapter of your life. Let’s go back to my examples above – I wrote costume designer and Renaissance fair performer on my list. How could I incorporate those into my life in some small way? The easy answer for this one is to begin sketching out costumes. I can spend time working on my design skills, and if I really wanted to go the extra mile, I can do a little bit of sewing to create simple garments. After all, there is no one stopping me from jumping into this but myself! Maybe you wrote professional basketball player on your list. Then spend time working on your layups, your three point shots. If you wrote dog trainer, then begin to find books from your local library or Youtube videos on the subject. 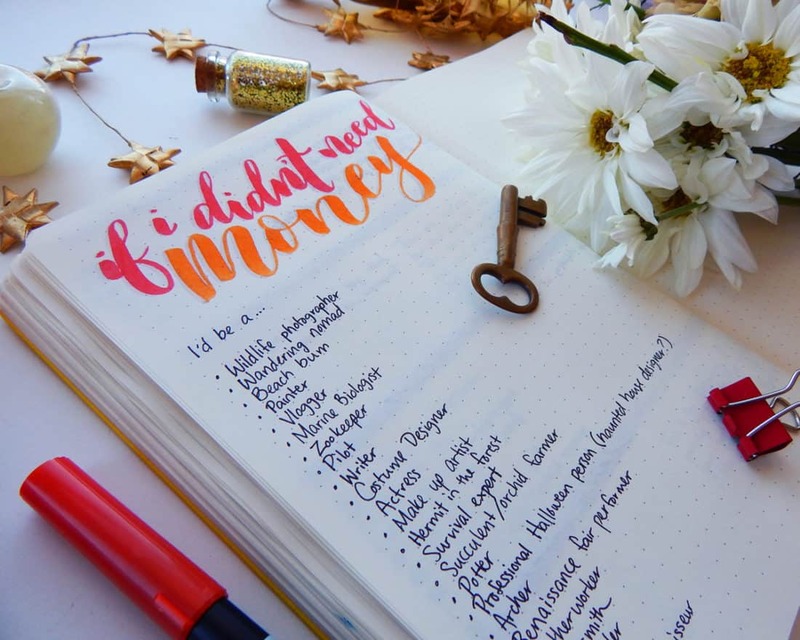 If travel is on your list, then you can begin to research destinations from the comfort of your own home and get your dream itinerary mapped out. Start saving right now, today, for your big trip down the road. My point is that there are a hundred ways that you can incorporate little bits of your list into your regular, every day life. You don’t need to go all in and quit your job, because let’s face it – you do need money. But this exercise is a great way to loosen up, play around with fun ideas, and begin to really brainstorm how to make these fantasies a reality one small piece at a time. 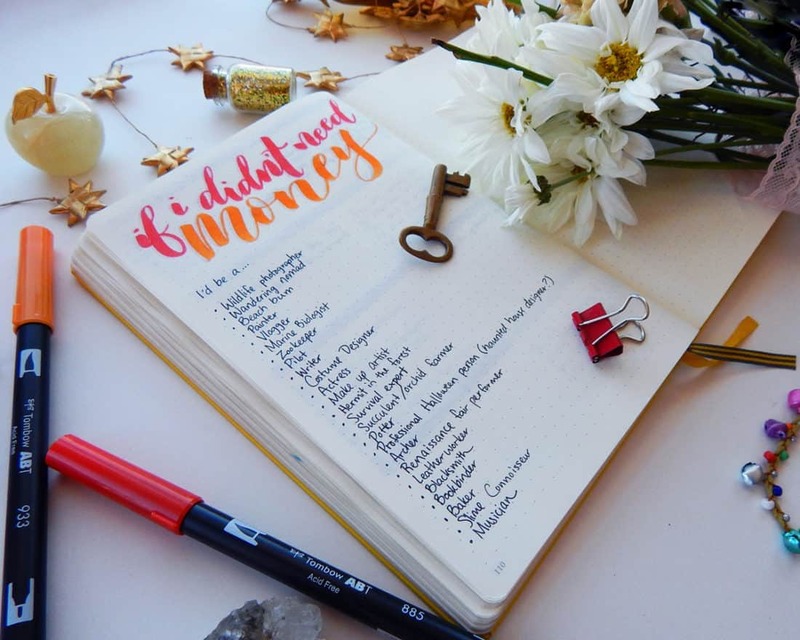 So open up your bullet journal, grab a nice pen, and let your imagination run wild! You never know where it might take you. Before I started college, my mom had me sit down and write a list of things I would do if someone gave me 10 million dollars. I wrote about my dream house, the people I would help, and some of the traveling I would do. When I got married, I reviewed the list with my husband. We took off the things I had gotten (a sewing machine and a car one year newer than my mother’s) and added his ideas. Your article gave me more ideas to add. Thanks. That is a great idea! My husband and I may need to sit down and make a list together that we can revisit in the future! Fun idea, thanks. We tend to forget that it doesn’t have to be all or nothing. And I would be doing you a disservice if I didn’t point out that it’s Henry David THOREAU. You are so right! Thank you for pointing that out Susan! ou are such an inspiration! I love this. I love to read and this is so in the same direction. Kind of like “Calgon take me away”. I’ve always imagined myself living by a big body of water. Small beach house year around. Occupying my time reading, writing, painting and photographing the beauty of it all. Summer beach parties with a few good friends. Lots and lots of wine. Who knows where I will be 5-10 years from now. Oh, Rosella, that sounds like a wonderful life! I wouldn’t mind that scenario either 😀 but there’s no reason it has to remain a dream forever! I love this. One thing on my list.. move to an island and sell ice cream (boom!) haha. I wish more people would do this and not think so much of how their passion will look on the outside to others. everyone tries to fit into this perfect little box (ew, boring). go be a triangle! Have fun and adventure love! Now that sounds like a fantastic life! While I’m bumming on the beach, I’ll buy some of your ice cream 😀 It’s a fun little exercise, isn’t it? It’s always nice to get out of your humdrum life for a minute and think about the whimsical!